The fastest-growing trend for designers and homeowners – Fire glass! As the name suggests fire glass is very commonly used in fire pits and fireplaces and is composed of very small bits of basic tempered glass. Introduced in the mid 2000s, fire glass has been up and coming and is now used on table top gas fireplaces, standard fireplaces and in the indoor fire pit. As a very popular alternative to ceramic gas logs, fire glass serves functionally as well as aesthetically. In comparison to a log fire that can kill the ambience of a flame whilst exposing natural gas and propane lines, fire glass provides an excellent way to cover up gas jets with exceptional crystals and pebbles – making it as aesthetically pleasing alongside increasing heat radiation by 4 times. Fire glass chips of pebbles are available in a wide range of colours and shapes, that create a beautiful feature in your garden or family room. Tempered glass is a glass with optimum safety features, hence the reason it is used for fire glass and within a variety of other products. Tempered glass can also be used for computer screens, shower enclosures & windows. Manufactured from recycled glass, fire glass is put through a treatment which allows the pebbles to meet hot flames, without ever damaging, exploding or melting, and does not emit any harmful substances into the air. Standard untreated glass can create a very nasty odour, and could be a danger as it can easily explode. In most cases, fire glass is available in the form of crystals, small pebbles or diamond shaped. A bit confused on what you would use fire crystals for? Don’t worry, that’s why we are here to help! Fire glass crystals sit atop a flame and have been precisely designed to hold them. They are commonly used in outdoor fire pits, you just pour the fire glass pebbles into the pit and turn on the gas! 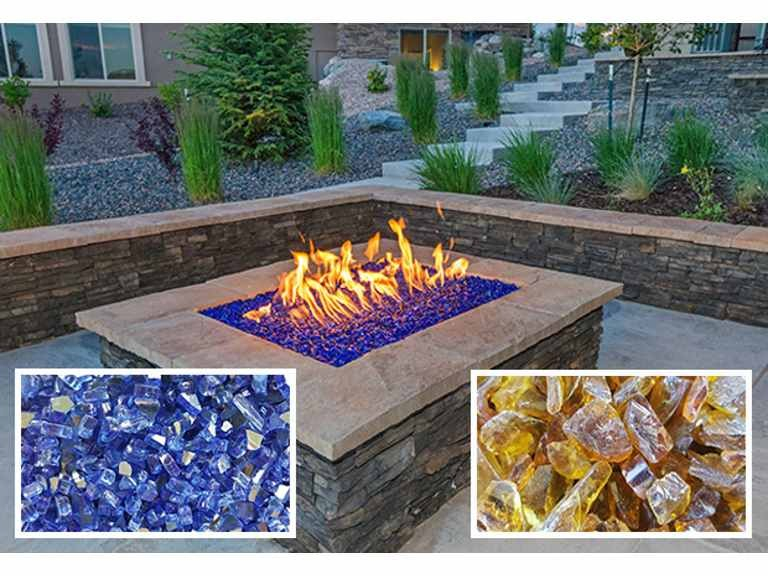 The translucent fire glass, glitters and shimmers when caught in the correct light and creates an exceptional, aesthetically pleasing fire to complete your outdoor experience. The flames rise around the fire glass in such a way that appears as though the pebbles are on fire and creates a beautiful view for a perfect evening around the fire. Available in a wide range of colours and shapes, you can customise them to fit with your interior designs. When the real flame goes with different colours, like onyx, topaz gold and aqua, it’s beautiful. Don’t believe us? We will let you be the judge of that when you're sat around your own. The amount of fire glass needed depends on the diameter of the fireplace and the depth you want to fill. By knowing the volume of the space you want, you can then calculate the correct amount for your fire pit. Don’t forget, it can be used indoors and outdoors, with natural gas or propane. It is the perfect addition to your home and is not only aesthetically pleasing but also makes your space more functional. Why miss out today? Call Lister Glass today and organise your summer ready fire pit, ready for all occasions!